The Monkees' second hit single was a two-sided monster, with another Tommy Boyce-Bobby Hart song (on the B side) and a contribution from Neil Diamond on the front. This was the first time the group would tap Neil Diamond, who had only recently had his first top 10 hit ("Cherry, Cherry"). I'm sure he was delighted to have this huge Monkees hit in his catalog, and followed it up by penning their next single, "A Little Bit Me, A Little Bit You." 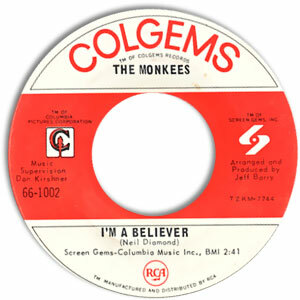 "I'm A Believer" became the biggest hit of the group's career, hogging the #1 spot on Billboard's Hot 100 chart for seven weeks! Note: This is a beautiful, Near Mint copy.